Some women are dealing with hyperpigmentation skin conditions. Others just want to lighten and refresh their skin tone. The science of vitamin C reveals it effectively lightens skin, mainly by decreasing the amount of melanin pigment skin cells make. The research shows topical treatment with vitamin C or derivatives, combined with dietary sources, is more effective than oral supplements. Does Vitamin C Lighten Skin? According to a 2007 review in Dermatologic Therapy, in the right form and concentration, vitamin C, or L-ascorbic acid, is a "highly effective de-pigmenting agent," and vitamin E improves vitamin C's effectiveness in the skin. A 2013 article in the Indian Dermatology Online Journal also notes vitamin C is an effective skin lightener and helps keep your skin healthy. A small study reported in 2004 in the International Journal of Dermatology found vitamin C applied for 16 weeks was effective in lightening the skin of patients with melasma. This was compared to the effectiveness of hydroquinone, the longstanding skin-lightening product. Though hydroquinone was more effective in lightening skin than vitamin C (93 percent versus 63 percent), vitamin C had fewer side effects than hydroquinone (6 percent versus 69 percent). The Journal of Clinical and Aesthetic Dermatology also notes that vitamin C is effective in treating the hyperpigmented skin conditions to which darker-skinned people are especially prone. A review by the Linus Pauling Institute of Oregon State University states aging, sun exposure, smoking, and other pollutants decrease the vitamin C content of skin and cause it to become dull and hyperpigmented. Adequate vitamin C in your diet or applied to your skin helps keep it lighter, brighter, and glowing, especially as you age. The amount of melanin skin cells (melanocytes) make determines skin color. 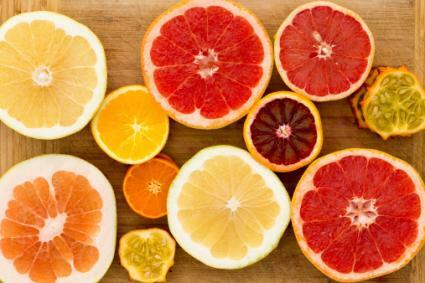 Vitamin C decreases melanin production by interfering with the action of tyrosinase - the first enzyme in the pathway that converts the amino acid tyrosine to melanin. There is less melanin to transport to higher levels of skin cells, so the skin lightens. It increases vitamin E and glutathione (a tri-amino acid antioxidant) in skin, which helps the skin to make more of the lighter, yellowish pheomelanin in preference to the darker eumelanin. Vitamin C also regenerates vitamin E; therefore, the two vitamins work in sync. It helps in skin cell division, renewal, and turnover so fresh, younger, lighter, and brighter cells appear on the skin's surface. Vitamin C has multiple roles in the body, but your body cannot make or store the water-soluble vitamin, according to a National Institutes of Health factsheet. You have to make sure you get enough in your daily diet to keep your skin healthy. Vitamin C is readily available in oranges, lemons, limes, dark green leafy vegetables, and other fruits and vegetables. Studies show vitamin C applied to your skin is more effective for skin lightening than taking a supplement. Based on the Linus Pauling Institute review, there is a limit to how much vitamin C your body can absorb or utilize from your food or a supplement. 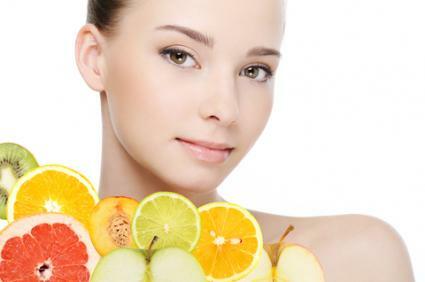 Therefore, the best approach to lighten your skin is to combine a diet rich in vitamin C with a topical skincare product. Although lab and clinical studies indicate vitamin C is an effective skin lightener, natural vitamin C is unstable when exposed to air, heat, or light, according to the Linus Pauling Institute. The resulting change in the molecule reduces the effectiveness of vitamin C in available skincare preparations. One study of magnesium ascorbyl phosphate, the most stable derivative, was published in the Journal of the American Academy of Dermatology. The derivative was found to be effective in lightening hyperpigmented spots in 19 of of 34 patients and normal skin in three out of 25 people. When applied to skin, vitamin C penetrates into the deeper layers of the epidermis where the melanocytes are and into the underlying dermis. However, the skin's tight ceramides and lipid barrier makes it challenging for vitamin C to penetrate the skin's surface (stratum corneum). There is ongoing research to improve the penetration and sustained release of vitamin C and other cosmecuetical agents through the skin, including the use of nanotechnology. The concentration of vitamin C is insufficient. The type of the vitamin C derivative is poorly absorbed or ineffective. The packaging does not protect the product from deteriorating. According to a 2013 review in the Journal of Cutaneous and Aesthetic Surgery, most products contain less than one percent vitamin C.
The Indian Dermatology Online Journal review notes vitamin E increases the effectiveness of vitamin C four fold. Vitamin C topical products may also include soy, licorice, alpha hydroxy acids, niacinamide, and other substances to improve the effectiveness as a skin lightener and anti-aging agent. The following selection of vitamin C topical products contain a sufficient percentage of L-ascorbic acid and are rated as effective by consumers. The Ordinary Vitamin C Suspension has 23 percent pure L-ascorbic acid and 2 percent hyaluronic spheres, which aids hydration, and other ingredients. Users describe a gritty feeling when applying the cream because of the spheres. A one ounce tube retails for $5.80 at Sephora. This pure L-Ascorbic Acid Powder is useful if you want to make your own serum or cream. The powder is soluble in water and not in oils. Follow the company directions for correct proportions to make your own effective product. Buy a six ounce jar for about $12 on Amazon. Vitamin C Skin Serum by J J Labs Skin Solutions contains 20 percent L-ascorbic acid and hyaluronic and citric acids. Consumer reviews remark on clearer more even-toned skin. You can purchase a one ounce bottle on Amazon for around $17. Philosophy Turbo Booster C Powder is formulated with "99.8 percent potency" L-ascorbic acid and vitamin B5 (panthenol), as well as aloe and amino acids. 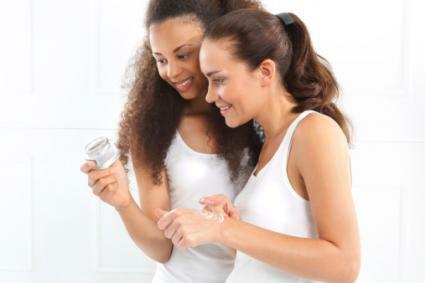 You mix a small amount of the powder into your moisturizer each morning, and users comment that the mixing is easy. The product goes for $39 at Sephora for a small 0.25 ounce bottle. Obagi Professional-C Serum with 20 percent L-ascorbic acid also contains hyaluronic acid. Users comment on seeing bright, clearer smoother skin in a month. The serum retails for about $58 for one ounce on Overstock.com. Perricone MD Vitamin C Ester Serum contains a fat-soluble vitamin C derivative for better skin absorption as well as botanicals, vitamin E, and preservatives. The brightening serum is described by users as lightweight and easy to apply. The product is available for $105 on the Perricone MD website. SkinCeuticals C E Ferulic serum has 15 percent L-ascorbic acid, vitamin E, and ferulic acid as the main active ingredients. The product is for daily use, but the company states that one application is effective for at least 72 hours. A one ounce bottle of the serum retails for $160 on the SkinCeuticals website. Do a gentle facial scrub to remove the outer, dead layers of skin cells for better absorption. Wash off the scrub and pat your face dry. Apply the product to your clean skin and massage in gently in a circular motion. Wait 10 minutes to allow it to begin to absorb and dry before applying a moisturizer, or use the product as your moisturizer. Apply a sunscreen if you are going outside. Use your product two or three times a day or as directed by the product label. Be sure to use it in the evening just before bedtime when light exposure will be less of a problem. Keep your vitamin C product tightly closed in a cool place to reduce exposure to air, heat and light. Don't use a product that has turned yellow because it is no longer effective. Expect that your skin tone or dark spots will lighten over time. How long this takes will vary with each person but in general, you should notice a visible difference by two to three weeks, and a significant difference in eight to 12 weeks. You have to continue to use the product to sustain the change. Always apply at least a 30 SPF sunscreen to protect yourself from the sun. Although there are no studies on vitamin C pills and skin lightening, advocates say taking a high dose supplement will lighten your skin. Vitamin C from your diet or pills gets to your skin via your bloodstream after absorption from your gut. However, as noted by the National Institutes of Health fact sheet, there is a limit to how much vitamin C your gut can absorb into your bloodstream - so taking more is not better. The suggested dose oral dose of vitamin C skin for lightening is 1,000 to 3,000 milligrams in divided doses of 500 milligrams each. However, according to MedlinePlus, it is not recommended to take more than 2,000 milligrams of vitamin C a day. Some supplements also contain glutathione to encourage production of the lighter pheomelanin and to improve the skin lightening effect of vitamin C. Based on a study in the European Journal of Clinical Pharmacology, however, oral glutathione does not contribute much to blood levels because it is broken up in the gut and liver. You can find various brands of vitamin C supplements in stores or online. A report published 2005 in the International Journal of Toxicology concluded, based on animal and human studies, vitamin C and its several derivatives used in skincare products are safe. Vitamin C can lighten your skin if you choose the right product and protect your skin from sun exposure. For best results, use a topical product instead of a supplement. In addition, eat plenty of vitamin C-rich foods and check out other natural ways to lighten your skin.